A Bahrain court has sentenced an online activist to six months in prison after convicting him for "defaming" King Hamad in comments posted on Twitter. In September, the prominent pro-democracy activist Zainab al-Khawaja was jailed for two months for damaging public property in a police station. Ms Khawaja's lawyer said she had torn up a picture of the king. The official Bahrain News Agency said that in addition to the prison sentence issued on Thursday, the court had ordered the online activist's laptop and mobile phone confiscated. Its verdict came a day after the government announced a ban on all rallies and public gatherings, prompting condemnation from human rights groups and opposition activists. Interior Minister Sheikh Rashid bin Abdullah Al Khalifah said "repeated abuse" of the rights to freedom of speech and expression - including riots, attacks on property and calls for the overthrow of "leading national figures" - could no longer be accepted. Legal action would be taken against anyone who organised or attended a rally, and the ban would remain in place until security was sufficient to preserve civil peace and protect national unity, he added. On Thursday, UN Secretary General Ban Ki-moon said the restrictions "could aggravate the situation in the country" and urged the government "to lift them without delay". Mr Ban reiterated his appeal to the Bahraini authorities to "abide fully by international human rights standards, including respect for freedom of expression and peaceful assembly and association", his spokesman said. He also called on people to ensure that demonstrations were peaceful, and said there needed to be an "all-inclusive and meaningful national dialogue that addresses the legitimate aspirations of all Bahrainis, as this is the only way towards greater stability and prosperity for all Bahrainis". 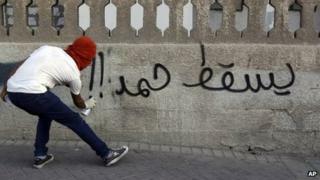 The US state department said it was "deeply concerned" by the protest ban, which it said violated fundamental human rights and was "contrary to Bahrain's professed commitment to reform and will not help advance national reconciliation nor build trust among all parties".